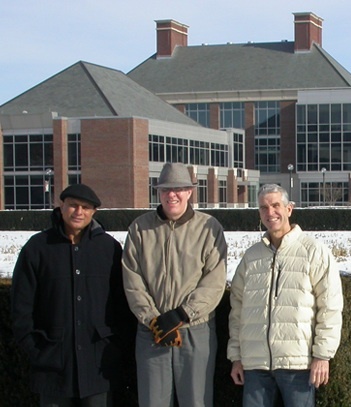 Well, that logic has come under fierce challenge from a team of University of Illinois researchers led by professors Richard Mulvaney, Saeed Khan, and Tim Ellsworth. In two recent papers the trio argues that the net effect of synthetic nitrogen use is to reduce soil’s organic matter content. Why? Because, they posit, nitrogen fertilizer stimulates soil microbes, which feast on organic matter. Over time, the impact of this enhanced microbial appetite outweighs the benefits of more crop residues. The loss of organic matter has other ill effects, the researchers say. Injured soil becomes prone to compaction, which makes it vulnerable to runoff and erosion and limits the growth of stabilizing plant roots. Worse yet, soil has a harder time holding water, making it ever more reliant on irrigation. As water becomes scarcer, this consequence of widespread synthetic N use will become more and more challenging. In short, “the soil is bleeding,” Mulvaney told me in an interview. 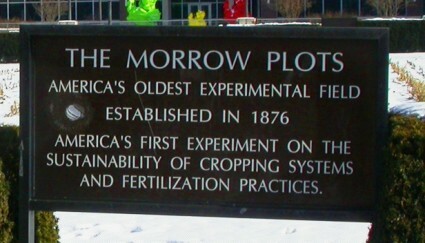 front of the Morrow Plots, University of Illinois. While their research bucks decades of received wisdom, the Illinois researchers know they aren’t breaking new ground here. “The fact is, the message we’re delivering in our papers really is a rediscovery of a message that appeared in the ’20s and ’30s,” Mulvaney says. That idea also appears prominently in The Soil and Health (1947), a founding text of modern organic agriculture. In that book, the British agronomist Sir Albert Howard stated the case clearly: The use of artificial manure, particularly [synthetic nitrogen] … does untold harm. The presence of additional combined nitrogen in an easily assimilable form stimulates the growth of fungi and other organisms which, in the search for organic matter needed for energy and for building up microbial tissue, use up first the reserve of soil humus and then the more resistant organic matter which cements soil particles. In other words, synthetic nitrogen degrades soil. That conclusion has been current in organic-farming circles since Sir Albert’s time. In an essay in the important 2002 anthology Fatal Harvest Reader, the California organic farmer Jason McKenney puts it like this: Fertilizer application begins the destruction of soil biodiversity by diminishing the role of nitrogen-fixing bacteria and amplifying the role of everything that feeds on nitrogen. These feeders then speed up the decomposition of organic matter and humus. As organic matter decreases, the physical structure of soil changes. With less pore space and less of their sponge-like qualities, soils are less efficient at storing water and air. More irrigation is needed. Water leeches through soils, draining away nutrients that no longer have an effective substrate on which to cling. With less available oxygen the growth of soil microbiology slows, and the intricate ecosystem of biological exchanges breaks down. 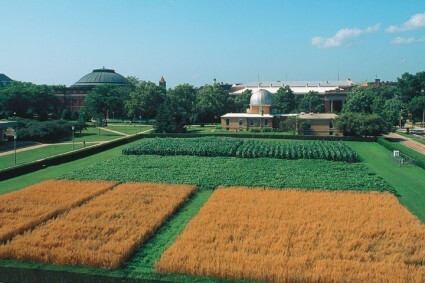 What sets the Illinois scientists apart from other critics of synthetic nitrogen is their provenance. Sir Albert’s denouncement sits in a dusty old tome that’s pretty obscure even within the organic-agriculture world; Jason McKenney is an organic farmer who operates near Berkeley–considered la-la land by mainstream soil scientists. Both can be — and, indeed have been — ignored by policymakers and large-scale farmers. By contrast, Mulvaney and his colleagues are living, credentialed scientists working at the premier research university in one of the nation’s most prodigious corn-producing–and nitrogen consuming –states. Abandon all hope, all fertilizer execs who enter here. Mulvaney and Khan laughed when I asked them what sort of response their work was getting in the soil-science world. “You can bet the fertilizer industry is aware of our work, and they aren’t too pleased,” Mulvaney said. Both published responses fall into the those-data-don’t-say-what-you-say-they category. Then he makes a startling concession: From the evidence presented in this paper, it would be fair to conclude that modern annual crop management systems are associated with declines in SOC concentrations and that increased residue inputs from high nitrogen applications do not mitigate this decline as much as we might hope. In other words, modern farming — i.e., the kind practiced on nearly all farmland in the United States — destroys soil carbon. The second second critique (PDF) came from a team led by D.S. Powlson at the Department of Soil Science and Centre for Soils and Ecosystem Function at the Rothamsted Research Station in the United Kingdom. Powlson and colleagues attack theMulvaney team’s contention that synthetic nitrogen depletes the soil’s ability to store nitrogen. In their response, Mulvaney and his colleagues mount a vigorous defense of their methodology. And then they conclude: In the modern era of intensified agriculture, soils are generally managed as a commodity to maximize short-term economic gain. Unfortunately, this concept entirely ignores the consequences for a vast array of biotic and abiotic soil processes that affect air and water quality and most important, the soil itself.